Limiting the use of electronic media, he said, was a similar public health issue. Doctors and government health officials should set limits, as they do for alcohol, on the amount of time children spend watching screens – and under-threes should be kept away from the television altogether, according to a paper in an influential medical journal. A review of the evidence in the Archives Of Disease in Childhood says children's obsession with TV, computers and screen games is causing developmental damage as well as long-term physical harm. Doctors at the Royal College of Paediatrics and Child Health, which co-owns the journal with the British Medical Journal group, say they are concerned. Guidelines in the US, Canada and Australia already urge limits on children's screen time, but there are none yet in Britain. The review was written by psychologist Dr Aric Sigman, author of a book on the subject, following a speech he gave to the RCPCH's annual conference. 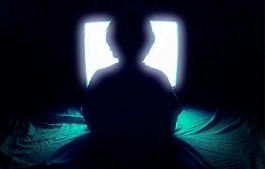 On average, he says, a British teenager spends six hours a day looking at screens at home – not including any time at school. In North America, it is nearer eight hours. But, says Sigman, negative effects on health kick in after about two hours of sitting still, with increased long-term risks of obesity and heart problems. The critical time for brain growth is the first three years of life, he says. That is when babies and small children need to interact with their parents, eye to eye, and not with a screen. Prof Mitch Blair, officer for health promotion at the college, said: "Whether it's mobile phones, games consoles, TVs or laptops, advances in technology mean children are exposed to screens for longer amounts of time than ever before. We are becoming increasingly concerned, as are paediatricians in several other countries, as to how this affects the rapidly developing brain in children and young people." 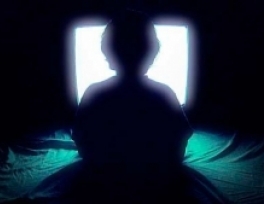 The US department of health and human services now specifically cites the reduction of screen time as a health priority, aiming "to increase the proportion of children aged 0 to two years who view no television or videos on an average weekday" and increase the proportion of older children up to 18 who have no more than two hours' screen time a day. The American Academy of Pediatrics has also issued guidance, saying "media – both foreground and background – have potentially negative effects and no known positive effects for children younger than 2 years". The Canadian Paediatric Society says no child should be allowed to have a television, computer or video game equipment in his or her bedroom. Sigman goes further, suggesting no screen time for the under-threes, rising gradually to a maximum of two hours for the over-16s. Parents should "encourage" no screens in the bedroom, he says, and be aware that their own viewing habits will influence their children. But the issue is controversial and his opinions and standing are questioned by Dorothy Bishop, professor of developmental neuropsychology at Oxford University who says that although this is an important topic, Sigman's paper is not "an impartial expert review of evidence for effects on health and child development". "Aric Sigman does not appear to have any academic or clinical position, or to have done any original research on this topic," she said. "His comments about impact of screen time on brain development and empathy seem speculative in my opinion, and the arguments that he makes could equally well be used to conclude that children should not read books." Sigman says he chooses not to have a job at a university and works in health education. "I go into schools and talk to children, usually about alcohol – trying to delay the age at which they start drinking," he said. Limiting the use of electronic media, he said, was a similar public health issue. Dr Louise Arsenault, senior lecturer at the Institute of Psychiatry, said: "The findings from this study are intriguing and add to an increasing body of evidence suggesting that a sedentary lifestyle is not optimal for the future of young children." It was "crucial to keep this activity in context with the rest of children's lives". Screen media could be a marker of a more generally unhealthy lifestyle that needed to be talked about by health practitioners, she said. Professor Lynne Murray, research professor in developmental psychopathology at the University of Reading, said there is "a well-established literature showing the adverse effects of screen experience on the cognitive development of children under three", but the adverse effects could be mitigated if the child was watching and interacting with "a supportive partner – usually adult". The RCPH's Professor Blair said there were some simple steps parents could take, "such as limiting toddler exposure as much as possible, keeping TVs and computers out of children's bedrooms, restricting prolonged periods of screen time (we would recommend less than two hours a day) and choosing programmes that have an educational element." But Justine Roberts, co-founder of Mumsnet, said it was hard for parents to compete with technology. "It would be great if someone could invent a lock that could automatically ensure a daily shut down of all the different devices in and around the home after a designated period. Until such a thing is invented, it's going to be an ongoing battle to keep on top of everything," she said.